The paint was fresh, but the building was ramshackle and the previous home to a furniture store. One one side sat an Office Depot. One the other end a Subway. In the middle a retail revelation known as Hastings. From the moment my buddy’s and I could drive, we spent far too much money in this place. It and CD Warehouse had become our second homes. We did not have a cool, indie record store like Empire Records or what I’d find in college at Sundance (now Superfly’s in San Marcos). We were in there so much that we became friends with the harried middle aged music snobs that worked behind the counters and stocked the shelves. This was the 90s, so the CD was the format du jour. But, these cats were already preaching vinyl to us. When Pearl Jam released Vitalogy on vinyl it was like a message coming down from the heavens confirming that these guys knew everything there was to know about music. These guys and gals had as much to do with shaping my musical path as anyone. Exposing me to new artists, lecturing me in patient, rehearsed soliloquies that would now be best housed in a podcast format. The day I turned 16 and had my first taste of highway freedom, I went straight from the DPS office across town to Hastings and spent nearly all of my birthday cash on records (Sublime’s 40 oz. to Freedom and a fresh, unscratched copy of Gary Stewart-Gary’s Greatest). Lest we forget the other items stocked here: incense, ripoff vintage t-shirts, instruments, movies, box sets, posters, toys. 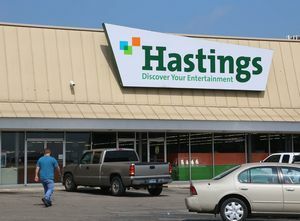 In its heyday, Hastings was kind of like pushing a Hot Topic into a Tower Records and hoping for the best. And the best is what I got. I, and many millions of other kids, who were coming of age in uncool towns without hip music stores turned our Hastings into what we needed it to be. Like so many things from that era, Hastings could not survive modern times. Cast aside alongside Blockbuster. Technology killed them. I’m grateful we still have places like Chief Records in Fort Worth, Superfly’s in San Marcos, Good Records in Dallas, and Cactus Music in Houston to name a few of the real independent trailblazer types still helping kids find a way. Still lecturing podcast style about the merits of the Brian Jones era Rolling Stones or the extreme awesomeness of Jerry Reed’s guitar picking. As much as I enjoy my modern phone convenience and carrying thousands and thousands of songs, artists, albums in my pocket…I miss the days of heading in to a record store and just looking around. Talking to the workers. Plunking down $15 on something just because it looked cool. Or the balding guy with sleeved out tattoos told you that you must have this new record he just got in from an indie punk label out of New Jersey because it will blow your mind. Or walking in to see one of your favorite new artists alongside the greats. I’ll never forget strolling in one day to discover Pat Green’s Here We Go right next to a George Strait record. It legitimized everything I was starting to believe in. That experience is gone for the most part. With this website and online community, we’ve tried to keep that going to some extent. Telling you what we think is good or what you need to hear. Showcasing acts you may not have otherwise discovered. Talking about it with the very devices that killed the original format. Adios Hastings. I’m going to come say a formal goodbye before you close your doors for good. I’m going to talk to the kid behind the counter about what he’s digging on. I’m going to spend $20 on a record I’ve never even heard of. I remember driving my ’79 Ford f-100 pickup, on my maiden solo voyage from Stamford to Abilene to Hastings on South 14th street. I still remember what I bought, Joe ely-love and danger,the essential Steve Earle, the dazed and confused soundtrack, Robert Earl Keen no.2 live diner, credence Clearwater revival chronicle, and Bob Dylan’s greatest hits vol.I and I. One of the greatest days of my life. I’ll miss Hastings. I just want to tell you that I am just very new to blogging and truly loved you’re web site. Almost certainly I’m want to bookmark your blog post . You absolutely have exceptional stories. Many thanks for sharing your webpage. I and also my friends happened to be digesting the nice information located on the website and then immediately came up with a terrible feeling I had not thanked the site owner for those secrets. Most of the ladies appeared to be as a consequence passionate to study them and now have actually been having fun with these things. Thanks for simply being simply considerate as well as for picking out this form of awesome themes most people are really desirous to learn about. My honest regret for not expressing appreciation to you sooner. Fantastic goods from you, man. I’ve understand your stuff previous to and you are just too magnificent. I really like what you have acquired here, really like what you are saying and the way in which you say it. You make it enjoyable and you still take care of to keep it smart. I can not wait to read much more from you. This is actually a terrific website. I¡¦m no longer positive the place you’re getting your information, but great topic. I must spend some time finding out more or figuring out more. Thanks for fantastic info I used to be on the lookout for this info for my mission. Aw, this was a very nice post. In idea I wish to put in writing like this additionally – taking time and precise effort to make a very good article… however what can I say… I procrastinate alot and in no way seem to get one thing done. you’re really a good webmaster. The web site loading speed is incredible. It seems that you are doing any distinctive trick. Furthermore, The contents are masterpiece. you have performed a great activity in this topic!